Oral Sodium Phosphate Linked to Kidney Problems | Hupy and Abraham, S.C. Oral Sodium Phosphate: Is It Safe? 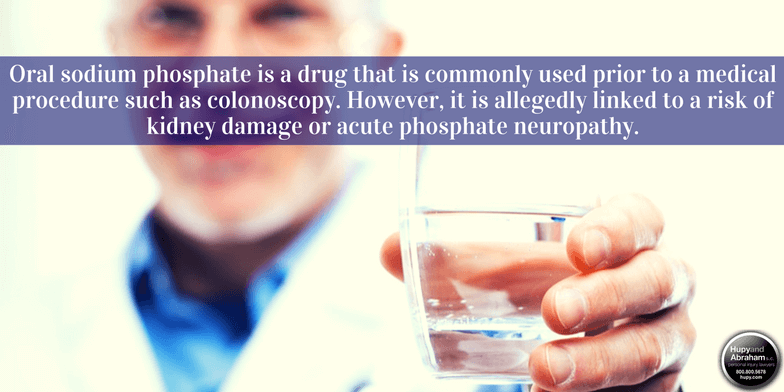 Oral sodium phosphate is a drug that is commonly used for bowel cleansing prior to a medical procedure such as colonoscopy. While it is often unpleasant to use, it is typically a necessary part of these important medical procedures. It is approved by the Food and Drug Administration (FDA), but it carries a black box warning about the risk of users developing acute phosphate neuropathy. Is Oral Sodium Phosphate Safe? Lethargy. Damage caused to the kidney may leave the victim feeling tired or fatigued. Decreased urination. When drinking the proper amount of fluids, urine flow should be regular. When there is a noticeable decrease in the output of urine, it may be a sign of kidney damage. Swelling. Suffering from kidney damage can cause the arms, feet, and legs to swell. This is due to water retention when kidney damage hampers the body’s ability to process fluids properly. Others signs of a serious problem could include an abnormal heart rate or high blood pressure. If you have experienced any of these symptoms and have previously taken oral sodium phosphate, you may be suffering from kidney damage and you should consult your doctor immediately. Then, if your doctor diagnoses you nephropathy, it is important that you keep following your doctor’s orders about how to treat this serious kidney condition. Your doctor may recommend kidney dialysis, a kidney transplant, or other lifesaving treatments. Treatments can be expensive, but they are necessary. Additionally, you should find out more about your legal rights if you are hurt by oral sodium phosphate or if you are hurt by any specific drug. Please download a FREE copy of our report, Oral Sodium Phosphate: What You Need to Know About It, and contact us directly via this website to discuss your specific situation in further detail.